Single. Child - Sylvia HARLAND (Illeg. ), born 19 October 1916 at Manaia. Height 5 feet 7 inches. Weight 156 lbs. Chest measurement 35-40 inches. Complexion fresh. Eyes brown. Hair dark brown. Eyes both 6/6. Hearing, colour vision, heart and lungs all normal. Full movement of joints. Chest and lungs well formed. No illnesses. Free from hernia, varicocele, varicose veins, haemorrhoids, inveterate or contagious skin disease. Not vaccinated. Good bodily and mental health. No fits. Class A. Youngest son of Irish parents, Thomas and Mary Ann LIVINGSTONE. Brother of Alexander Reuel LIVINGSTONE who was also killed in action. Brothers Robert Heaton and Thomas McClelland LIVINGSTONE also served in WWI; another brother, Henry Gillies LIVINGSTONE, was stationed as adjutant to the C. Y. C. (1917). Eric attended High Street Dunedin, Lyttelton, West Christchurch schools and Christchurch Boys' High School. In 1914 at West Christchurch School he gained the cup for the best all-round boy. He was a powerful swimmer and held many medals for life-saving and swimming. He was also a promising member of the Canterbury Rowing Club, and a fine footballer, having played for the B. H. S. first fifteen and for Old Boys. He enlisted on his 20th birthday and spent his 21st birthday in France, only to be killed one month later. He was buried first in an isolated grave at Pont a Pierres, nearly 3 miles from Quesnoy. On 20 August 1917 he was among the Canterbury men who paraded at the King Edward Barracks before departing for the training camps of the North Island. In September he was appointed a probationary corporal. 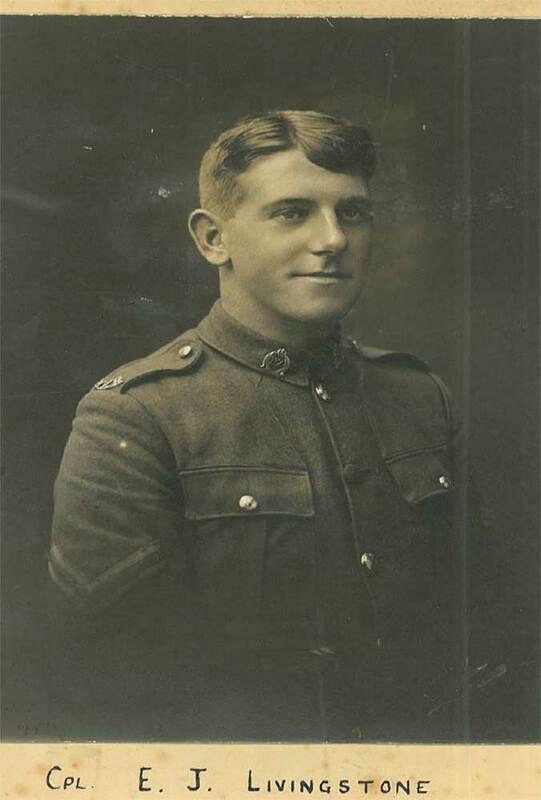 Eric was among those who had fallen since the previous Anzac Day who were remembered at a memorial service held on 25 April 1919 in the Canterbury College Hall, in memory of old boys of Christchurch Boys' High School. And at the annual meeting of the Canterbury Rowing held on 29 September 1919, Eric and his brother Reuel were named in the club's Roll of Honour. On 3 June 1918, he stated that he had already made a Will which was held by the Public Trustee, Christchurch. His medals were sent to his father. However the plaque and scroll were sent in 1922 to Miss Dell HARLAND or Mrs Agnes HARLAND (guardian), 36 Strowan Road, Fendalton, Christchurch, to be held in trust for his child, Sylvia HARLAND b.1916 (who later married Harry MARSON).